After two World Wars the United Nations Organization (UN), through the Organization of the United Nations for Education, Science and Culture (UNESCO), promoted the conservation and care of heritage in order to unite people and avoid confrontations. One of the strategies for carrying it out was the Convention on the Protection of World Heritage of 1972. It argued that cultural heritage is an element of contact between peoples and cultures, which allows dialogue, understanding, tolerance and mutual recognition through international collaboration. Such advances owe much to the thinking of Alois Riegl, who laid the foundations for these concepts. 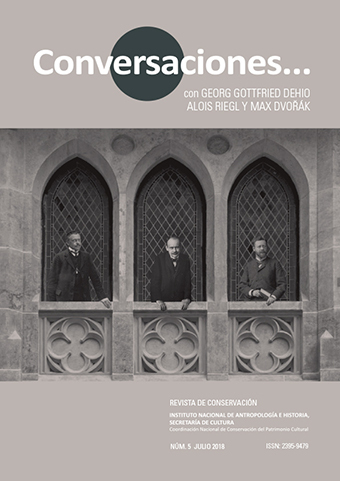 This text aims at exploring the contributions of this author in the field of conservation theory and the circumstances in which they were developed in order to highlight the importance and validity they currently maintain, and how their ideas gave rise to more plural and cultural concepts. Arrhenius, Thordis (2003) “The fragile monument: On Alois Riegl´s Modern Cult of Monuments”, Nordisk Arkitekturforskning, Nordic journal of architectural research (4): 51-55 [http://arkitekturforskning.net/na/article/viewFile/296/256] (consultado el 28 de abril de 2018).